Placing flowers in the bedroom is one of those little things you can do to make you and your room feel special. Clustering a few container of flowers is a great way to get a bouquet effect without having to do any flower arranging. Or just by using an interesting vessel, you can enjoy a single bloom. For this dresser, I just added a few blooms in my vintage lab kit. This was an old dresser that I painted blue and styled to bring new life to it. 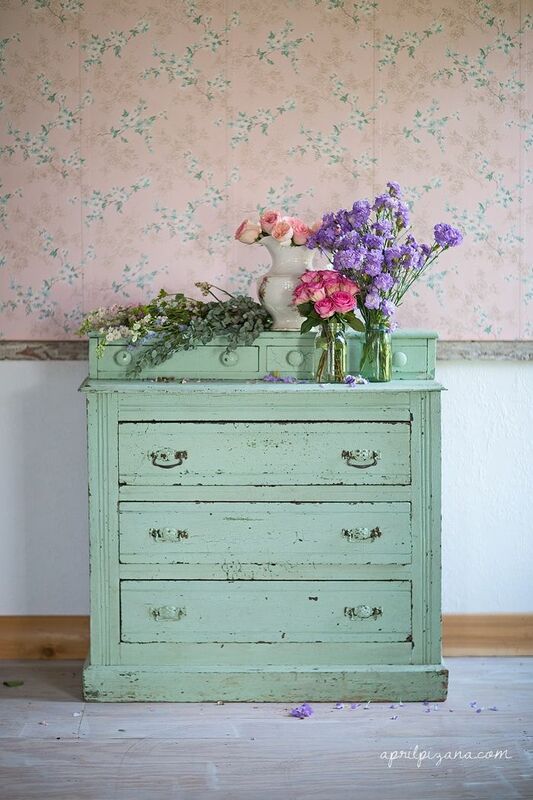 You can read all about how to style a dresser with flowers here. This dresser also received a paint job and had some new life breathed into it. It is a large dresser in a white room, so I like to add larger and brighter flowers or lush big branches to this bedroom dresser. Now it’s your turn. Take a look at your bedroom dresser. Is it large or small? If it is large, you can go with a wider arrangement. If it is small, a slimmer design is a better idea. If the room is dark, I suggest using white blooms. If the room is white, I suggest pinks, reds or oranges. Go experiment and enjoy your sacred space.